Rescuers from Marysville Division of Fire as well as from Allen and Washington townships worked for more than three hours Monday to recover the body of 34-year-old Christopher McDonald. The J&J Schlaegel employee was working inside a trench as part of the city’s Plum Street improvement project when the trench walls collapsed, killing him. Investigators say they do not know why an employee was working inside a trench when the trench collapsed. 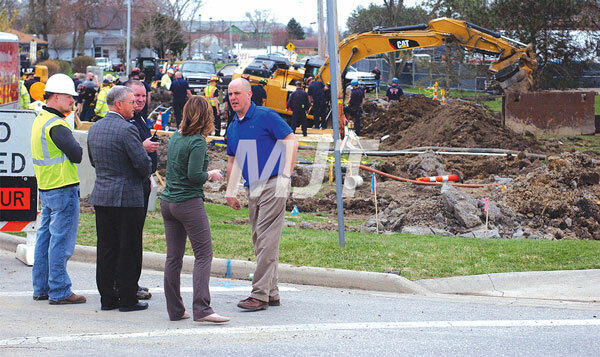 Officials said there was no reason for him to be inside the trench before a trench box, seen at the right, was in place. Pictured above are, from left, City Manager Terry Emery, Fire Chief Jay Riley, Executive Assistant Anna Krutowskis and City Engineer Jeremy Hoyt. A construction worker is dead and investigators say they do not know why he was inside a trench without reinforcement. Christopher McDonald, 34, of Nashport, was declared dead at 12:57 p.m., Monday. McDonald was working Monday as part of a Marysville City project on Plum Street, near the Town Run bridge. McDonald was inside a trench 15-20 feet deep. The man was inside the trench without a trench box to protect him. A trench box or trench shield is used to protect workers from cave-ins. They are often a steel or aluminum structure, constructed with sidewalls of varying thicknesses held apart by steel or aluminum spreaders. “We had no knowledge someone was entering the trench site,” Marysville City Manager Terry Emery said. The city hired contractor, Urbana-based J&J Schlaegel to perform a waterline relocation as part of the overall project. McDonald was working for the company. “They were prepping the site for the trench box,” said Emery. “It was a choice at a moment in time,” Emery said. City Engineer Jeremy Hoyt said a city inspector had been onsite less than five minutes earlier. He said the inspector did not see anyone inside the trench. 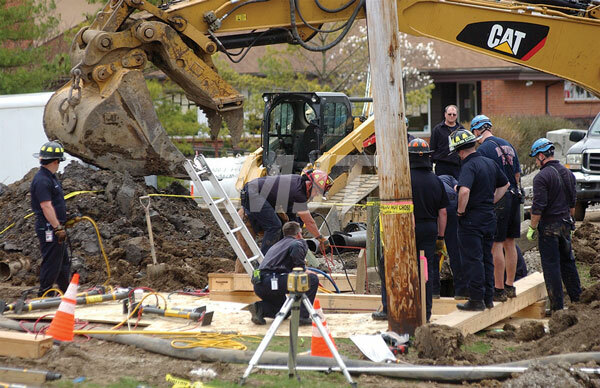 Witnesses said McDonald was walking out of the trench when it collapsed around him. Coworkers called 911 at 12:36 p.m.
Riley said rescuers worked for about 20 minutes before they reached him. Lance Emberling, with the county coroner’s office, said McDonald was declared dead at 12:57 p.m., but because it remains under investigation, an exact cause is not yet known. Units from Marysville, Allen Township and Washington Township worked to recover the man’s body. A vactor truck was eventually called to the scene because the trench continued to fill with water and Emery said that was the best way to clear mud and water from it without damaging McDonald’s body. At 3:52, McDonald’s body was lifted from the trench and taken to an ambulance. Monday’s City Council meeting opened with a moment of silence for McDonald and his family. Many council members shared their thoughts and prayers, but councilman Mark Reams had harsh words. He said there are safety measures to keep a trench from collapsing. Officials did commend members of the city police and fire departments as well as the streets and water department. He said city worker Corey Bunsold took control of Schlaegel’s equipment. “The contractors onsite, they were in no condition to operate the equipment base on what happened,” Riley said about the distraught coworkers. “If you are a street employee, when you get up and go into a work day, you never envision encountering this type of thing,” Emery said. Council member Scott Brock said he used to work for the city and his coworkers always exhibited a willingness to step up to any emergency. “It’s nice to see that family mentality of teamwork and stepping in to just get things done still exists,” Brock said.